One of the strange and scary things about hundred milers is how quickly even these monumental undertakings can start to seem routine. Bryce 100 was my third such race, and the third in only nine months, and I went into it excited, yes, but without any of the existential terror that accompanied my first two. Fortunately, all I had to do to cure this condition was run the thing. I expected Bryce to be the easiest of my three hundred milers by a fair margin. Headlands had been my first, and I’d packed a number of big rookie mistakes into a rugged course with 20,000 feet of climbing and eked out a 32.5 hour finish just under the time limit. I’d been much better prepared for HURT, but it’s an extremely technical course throughout that never stops rising or falling, with a total of close to 25,000 feet of uphill gain. 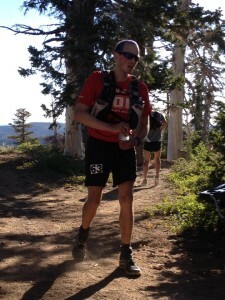 There were different estimates for the elevation gain at Bryce – not only was this the inaugural running, but there had been several late course changes – but the consensus seemed to be settling on the neighborhood of 19,000 feet, which I was sure I could handle well under the 36 hour cutoff. More interesting would be the actual altitude of the course. The first eighty miles were all above 8,000 feet, with a peak elevation of around 9,500. I’d done some recent training runs at around 8,000 feet in Yosemite, and I knew the thin air could slow me down on long ascents, already a weak point in my running. If that was the worst of it, though, I figured I’d be in good shape, and hoped to finish in around thirty hours. When race morning arrived, we gathered at a parking lot for an ATV trail about fifteen miles from Bryce Canyon National Park. For most of the race, we would be running above the park, farther west on the Paunsagaunt Plateau. Due to limited space at the actual starting line, we’d be shuttled up from the parking lot. However, there was only one school bus (that I saw) running up the bumpy dirt road, and more than two hundred runners who needed a ride. With forty of my closest friends, I jumped into the back of a twenty-four foot U-Haul for the trip. I clambered up onto “Mom’s Attic” to make room for more runners, and threatened a quick stage dive. The truck started its way up the dirt road, and immediately filled with dust, looking for all the world like a crappy Burning Man art car. Fringe sporting event or conceptual art prank, on those trails my lungs would be full of dust by the next morning regardless. Most of the first sixty miles were single track forest trails, so it took a while for the 210 or so starters (including forty 100K runners) to spread out. As soon we started to get some space between us, traffic backed up as runners all stopped to take pictures where the Thunder Mountain trail opened up to views of nearby pink rock hoodoos and the sweeping pine forest of the lower plateau. I commented to another runner that my time would only be improved by the fact that my phone’s battery had died overnight, but in truth I never stop to take photos during a race anyway. I rolled my ankle coming into the first aid station at mile ten. I don’t know if it was here or later on that I hurt my foot, but by the next morning it would be a major problem. Although I felt like I was pacing myself well, it only took a few hours for my legs to start feeling fatigued, which I attributed to the altitude. I never had trouble breathing, headaches, or worse symptoms of altitude sickness, but I simply wasn’t sucking in enough oxygen to give my my muscles all the energy they needed. Worse, after the first 50K we climbed to above 9,000 feet and stayed there for about five miles, and here is where I really felt the effects. Although the terrain was pretty easy, I slowed to a crawl and started to fall asleep on my feet, a feeling I’ve never had before so early in a race. I resorted to caffeine at the next aid station, far sooner than I’d planned, which meant I’d be stringing myself along on stimulants for closer to twenty-five hours than the maximum of twenty I’d hoped for. Another descent, another climb, and before long I was summiting Pink Cliffs, the high point of the run. At 9,500 feet, I expected to have more problems with altitude, but the ascent and descent were short and sharp, which I dealt with better. In the meantime, I did my best to savor sweeping views across the plateau, Bryce Canyon, and on beyond Zion. Coming into Pink Cliffs at mile 45. From the Bryce 100 Facebook page. Ten miles later, coming back up to the Pink Cliffs aid station after the turnaround, the sun disappeared and the temperature on the ridge plummeted in fast winds. The high school class out volunteering would spend their night not only making soup for us, but struggling to keep their shelter from blowing over. Shivering, I changed into a pair of tights, a long shirt and a light jacket, and made the mistake of changing my shoes. The first pair still felt good, but I thought a new pair would feel even better – two miles later I regretted it, but I was stuck with them for the rest of the race. Maybe that’s what put my foot over the edge from aggravated to injury, but it’s hard to tell. Certainly, they were less comfortable and left me with a couple of raw spots. As soon as I started moving again and dropping down from the ridge, I warmed up and didn’t have any more problems with the cold that night, even as the wind continued. Now and then it would pick up and send a dust devil skittering off like a trail spirit in the glow of my headlamp. Shortly after sunrise I came up to the last familiar aid station before splitting off on the twenty mile finish leg of the course. I was handed a hot banana pancake and a cup of foul instant coffee (manna nonetheless) to eat on the go as I made my way up a dusty dirt road before beginning a long descent toward the next aid station, the King Creek campground where I’d spent the previous night. Toward the end of this long dirt road descent, my foot finally gave out. I’d been feeling discomfort or occasional pain from the front of my left ankle now and then for I didn’t know how many hours, but as long as I was careful to land on the front of that foot it seemed okay. Now it was overtaking me, and I was slowing to a walk even on gentle downhills. By mile 85, the morning was heating up, and I found myself presented with an unexpected climb up the (beautiful, but in the moment resented) Keyhole Arch trail. For the first time in a hundred miler, I found myself doubting my ability to finish the course. I spent some time sitting on a log when I knew I could have been climbing, just waiting, for what I don’t know – for my foot to heal, for endorphins to go back to masking the pain, for myself to start caring again as much as I had only an hour before. Once I started moving again, all I needed was to crest the hill for my problems to sort themselves out. I was able to really start running downhill again, free from pain and full of energy, excited by the familiar location of the campground and the knowledge that it signified the final leg of the course. Eleven more miles. After the day and the night I’d already been through, I could crawl eleven miles if I had to. Except that the day was getting ripe, and hot, and the rest of the course was almost nothing but dusty dirt roads, free of shade. When I finally found a good downhill stretch, I started running hard again, but found at the bottom a water stop I’d forgotten was on the course, which meant I still had five miles to go. I pressed on slowly, resting a couple of times in the rare spots of shade, pouring out a little bit of water over my head as I went elsewhere. Finally, when it seemed I couldn’t possibly be more than a mile from the end, I picked up and started running again. It must have been fairly slow, but to remember the actual mechanics of running after so much time on my feet is always amazing. Only that one mile stretched into two, then three. Thanks to the last course change, the final leg of race had turned out to be thirteen miles instead of the planned eleven. No matter. I kept running until I saw the finish, and then I even managed to pick up speed, crossing that arbitrary line in the sand with everything I had left in me, arms wide in celebration. Every time I run, after all, that’s the real point: everything I’ve got. In running all day, all night, and into the next day, I keep learning more about what that is. It turns out sometimes that being hurt, being tired, feeling like the world and the sun are coming down on top of me aren’t so bad. I’ve just got to know where I’m going and remember to breathe.